‘The two-state solution is vanishing’ – Jimmy Carter, Gro Harlem Brundtland and Mary Robinson urge a fresh approach to achieving lasting peace in the Middle East The Elders have concluded a two-day visit to Israel and the West Bank by saying that the two-state solution is in deep peril; but that it remains the only realistic path to lasting peace in the Middle East. The Elders have concluded a two-day visit to Israel and the West Bank by saying that the two-state solution is in deep peril and may soon be out of reach. They urge a fresh, concerted approach to explore all alternatives to the current stalemate in negotiations, stressing that a two-state solution is the only realistic path to lasting peace in the Middle East. During their visit the Elders met the President of Israel, Shimon Peres, the President of the Palestinian Authority, Mahmoud Abbas, international officials and a range of Israeli and Palestinian groups. They will continue their discussions on this issue in Cairo in the coming days. “We are heading towards a one-state outcome, which will fail to ensure the security and democratic rights of the people of Israel and renege on the promise of self-determination for Palestinians. The two-state solution is vanishing. We urgently need a fresh approach by all parties if a Palestinian state is to be achieved. The Elders toured Jerusalem to view the changing urban landscape and demography of the city, a result of policies designed to expand and deepen the Israeli presence and restrict the Palestinian presence. “It has been very sad to hear of the considerable problems that long-standing Palestinian residents of East Jerusalem face in their everyday lives – from having to reapply every year for the right to stay, to businesspeople waiting years for licenses, to those who have lost their homes to settlers or demolition. The effect of this system is to create great suffering, and erode the diverse character of this city, which is so important for people of all faiths and traditions from all around the world. The Elders expressed their concern about the ongoing divisions between the leading Palestinian parties, Fatah and Hamas, again evident in Hamas’ boycott of the municipal elections in the West Bank on Saturday (20 October). Unity is urgently needed so that the vital interests of the Palestinian people are properly represented and to bridge the widening gulf between the Gaza Strip and the West Bank. The Israeli-Palestinian conflict has been one of The Elders’ top priorities since the group was founded. In August 2009, an Elders delegation visited Israel and the West Bank to meet youth representatives, non-violent activists, women’s organisations, human rights experts and UN agencies, as well as Israeli and Palestinian officials. From both Israelis and Palestinians, they heard a consistent message that peace is possible and achievable. The Elders next travelled to the region as a group in October 2010, visiting Israel, the West Bank and Gaza, Egypt, Jordan and Syria. They called for a more comprehensive approach to the Israeli-Palestinian peace talks following discussions with government officials, civil society, business leaders and young people. The Elders emphasised that ending the occupation of Palestinian land is the only way for Israel to achieve peace and enjoy normal relations with Palestinians and their Arab neighbours. 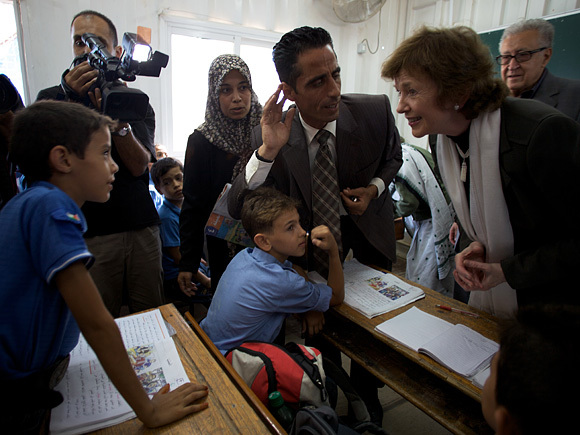 In October 2012, former Prime Minister of Norway Gro Harlem Brundtland, former US President Jimmy Carter and former President of Ireland Mary Robinson are returning to Israel and the West Bank. During their visit, the Elders will express concern about the future of the two-state solution and highlight the effect of settlement expansion and other changes in the city of Jerusalem as a major impediment to peace between Israelis and Palestinians. While The Elders actively support international efforts to achieve a comprehensive settlement, they do not act as mediators in this conflict. Working both privately and publicly, The Elders aim to build awareness and popular support for a just and secure peace for all.